The Camino de Santiago de Compostela is a UNESCO World Heritage Site and home to architectural gems built over the centuries to meet pilgrims’ needs: churches, hospices and monasteries dot the 1,500km of official routes. Four of them can be discovered in Charente. Mark your calendars! 2018 will mark twenty years since the Camino was officially recognised. Commemorative walks with concerts, sports events and shows will be organised throughout summer between Melle, Aulnay-de Saintonge, Saint-Jean-d’Angély, Fenioux, Saintes and Pons. An exceptionally preserved masterpiece of 12th-century Romanesque art, the Saint-Pierre d’Aulnay church overlooks a cemetery that is home to stone tombs and a 14th-century “hosanna cross”. The church’s showpiece is its south door, decorated with finely sculpted arches drawing on various oriental influences. It features fantastic beasts (try to find the donkey musician, the owl and the mermaid), the apostles and the prophets – it’s quite the comic strip! The main door boasts the signs of the zodiac, farming scenes, the vices and virtues, and angels adoring the lamb. You’ll be able to spot the traces of colour, a reminder that, in its heyday, every inch of the church was painted! As you continue, look up. In the apse, you’ll see 36 modillions, each more amazing than the last: an Oliphant horn, a warrior dressed in chainmail, a monster who’s just devoured an unfortunate soul and a couple of lovers – no two designs are the same! Swap the light for the shadow: the inside of the church is as understated as the outside is exuberant and offers a wealth of breath-taking architecture. 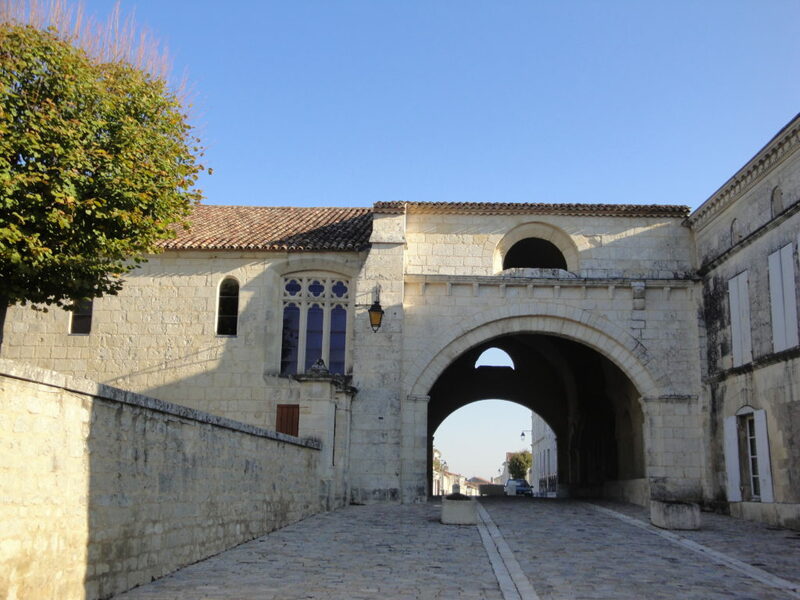 This abbey was built in the 9th century by Pepin I (Charlemagne’s grandson) to house the skull of St John the Baptist. Used to venerate the precious relic, Saint-Jean-d’Angély rapidly became an important stop on the Camino de Santiago. Destroyed and rebuilt several times, the Abbey would become one of the most powerful in western France. The last reconstruction project was interrupted by the Revolution. 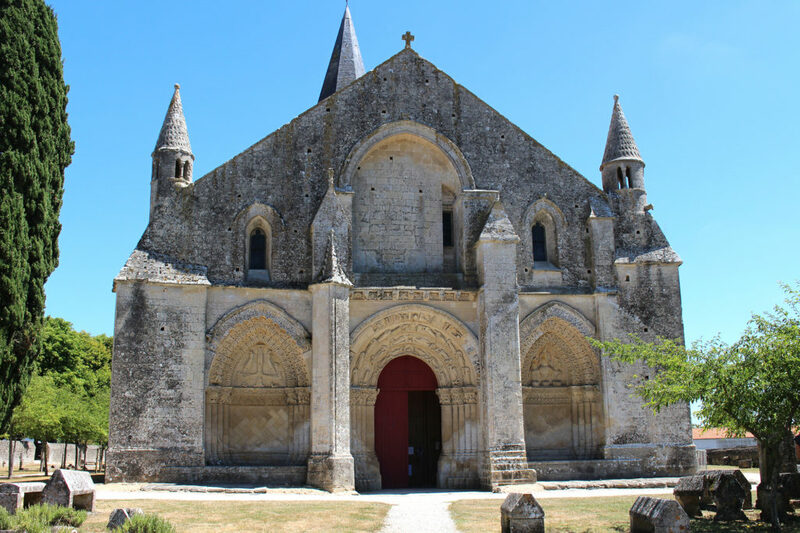 With its classic architecture, the Abbey we see today features a monumental door and two imposing dome-topped towers and has become the cultural centre of Saint-Jean-d’Angély. 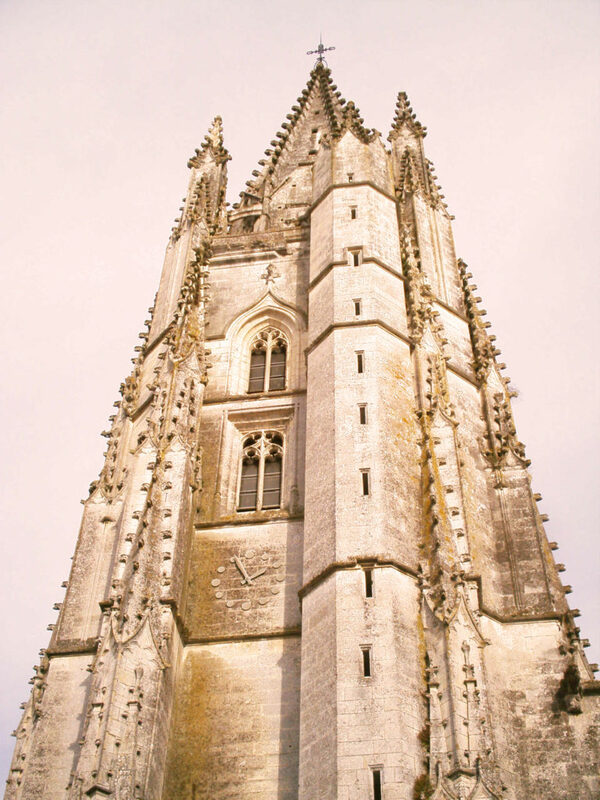 Make sure you climb the towers – the 360° view of the medieval town and the Saintonge Dorée region is simply astonishing. Built outside the town walls, this building offered pilgrims walking to Santiago de Compostela a place to spend the night when the town gates were closed. The hospice complex is among the oldest still standing in Europe. Its Romanesque porch is particularly well preserved – you can even see the strange graffiti carved into it by pilgrims! After your visit, during which you’ll discover the sick room and the pharmacy, don’t forget to take a walk around the vast medieval gardens that are home to more than 100 species of medicinal plants. Built above the town, Saint Eutrope Church is a masterpiece of Romanesque architecture. Dedicated to the first evangelist of Saintonge, the church, which was consecrated by the Pope in the 11th century, quickly became an unmissable stop on the Camino de Santiago de Compostela. The crypt’s vault is supported by huge pillars and is one of the biggest in Europe. This space, which houses the Saint’s tomb, gives off a striking feeling of power and spirituality. Just above the crypt (known as the “low” church), the “high” church is dominated by an impressive 65-metre high spire and boasts a unique set of sculpted capitals. The high and low churches were originally linked to allow the crowds of pilgrims gathered there to circulate. Louis XIV’s famous military architect, Vauban, created a body of work that features more than 160 strongholds. Twelve of the most remarkable have been classified as UNESCO World Heritage Sites, including the ramparts of Saint-Martin-de-Ré on Île de Ré. Designed down to the last detail by Vauban, this magnificent star-shaped fort built in the late 17th century by order of the King, protected La Rochelle, Rochefort and the island’s population. The outer wall that surrounds the town, the fortress (which isn’t accessible to visitors) and port contain two monumental gates and some 14km of stone ramparts! This stronghold never came under enemy attack and is remarkably well preserved.